Thanks to organizations such as Mises Brasil, Instituto Rothbard, Students for Liberty and more, the works of great thinkers such as Mises, Murray Rothbard, Frédéric Bastiat, and more have been translated and dispersed throughout the country. 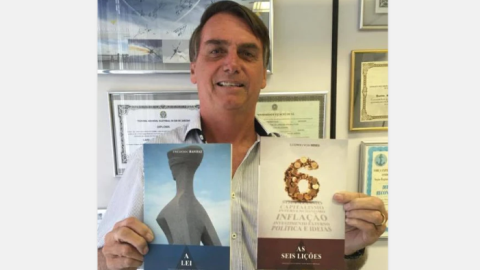 President Bolsonaro has even been photographed with Portuguese copies of Bastiat’sThe Law and Mises’s Economic Policy. This is important not only because it highlights the growth of these ideas beyond the narrow lens of politics, but also because it demonstrates that Bolsonaro has a talent pool to be able to tap into for his administration. In the words of Mises Brasil president Helio Beltrão, the new president has put together a “remarkable team and with noble intentions.” This includes scholars affiliated with various free market and libertarian organizations, including Mises Brasil, have been tapped for positions within the administration — including Bruno Garschagen, host of their popular podcast. The new Minister of Education, Ricardo Velez Rodrigues, was himself a guest of the show. Another promising sign that has come from Lorenzoni is that he has instructed all government ministers to inventory the properties under their control so they can identify what assets are better off being privatized. The hope is that the Bolsonaro administration will follow through on the statements made by Paulo Guedes, the new Minister of the Economy, to “privatize everything that is possible.” Not only will such sales help to work down the countries debt (currently at $1.6 trillion, or 81.4% of GDP), but allow assets and companies to operate more efficiently free of the strangulation of government central planning. This article was originally published at Mises.org. Tho Bishop is an assistant editor for the Mises Wire.